Celeste Beryl Bonin (born October 7, 1986 in Houston, Texas) is an American entrepreneur, bodybuilder, model, and retired professional wrestler. She is best known for her time in WWE under the ring name Kaitlyn. She started her career as a body fitness model. In 2007, she won the National Physique Committee (NPC) John Sherman Classic Bodybuilding Figure and Fitness Championship, and came in fifth at the Arnold Classic in the NPC Figure Class D competition. In July 2010, she signed a developmental contract with WWE. Later that year, she competed in and won the all-female third season of NXT, thus earning a spot on the main roster. She won the WWE Divas Championship in January 2013 and held the title for five months. Bonin made her body fitness debut in 2006, at the age of 19. In 2007, Bonin won the National Physique Committee (NPC) John Sherman Classic Bodybuilding Figure and Fitness Championship, and came fifth at the Arnold Classic in the NPC Figure Class D competition. She also was in the top five at Musclemania Superbody in 2007, in the Figure Universe – Tall category. In 2008, she was named Miss November at the Hardfitness Calendar, and placed 16th at the NPC Junior Nationals that same year in the NPC Figure category. In 2008 she was part of the Hardfitness Calendar and in 2009, Bonin appeared in Flex magazine. In July 2010, World Wrestling Entertainment (WWE) signed Bonin to a developmental contract, and she reported to Florida Championship Wrestling, WWE's developmental territory. She debuted under the ring name Celeste, competing in a bikini contest. Her name was soon changed to Ricki Vaughn, and quuickly changed again to Kaitlyn, her name on NXT. On the August 22, 2010 episode of FCW television, she would make her FCW TV debut as a lumberjill at ringside for a match between AJ Lee and Naomi Knight but did not wrestle. On the November 7, 2010 episode of FCW TV, Kaitlyn competed in a tag team match teaming with Naomi defeating then Queen of FCW AJ and Aksana. When WWE rebranded its developmental territory, FCW, into NXT Wrestling in 2012, Kaitlyn briefly portrayed a villainous persona while on the new version of NXT in 2012..
On September 7, 2010, it was announced that Celeste Bonin would join season three of NXT, under the name Kaitlyn, with Vickie Guerrero as her pro. She was the replacement for Vickie's original rookie, Aloisia, whom Vickie fired in storyline. That week, she unsuccessfully competed in both a dance competition (where she performed moves like the robot and running man), and a "Capture the Flag" contest. The following week on the September 14 NXT, Kaitlyn made her in-ring debut, when she teamed up with Vickie's on-screen boyfriend Dolph Ziggler to defeat AJ and Primo in a mixed tag team match, and also won the obstacle course challenge. Kaitlyn made her first pay-per-view appearance at Night of Champions accompanying Ziggler with Vickie for Ziggler's WWE Intercontinental Championship match, until Vickie ordered her to leave ringside. On the September 21 NXT, Kaitlyn and LayCool (Layla and Michelle McCool) lost to Kelly Kelly, Naomi, and Jamie in a six-Diva tag team match after Naomi pinned Kaitlyn, and ended the show after LayCool attacked her while Vickie berated her. That same week on the September 24 SmackDown, Kaitlyn and Vickie accompanied Ziggler to the ring for his match until Vickie again ordered Kaitlyn to leave ringside, leading to Kaitlyn pushing her over before leaving. On the September 28 NXT, Kaitlyn won a wheelbarrow race and lost a "Diss the Diva" challenge, which led to Vickie entering the ring and insulting her until Kaitlyn challenged Vickie to a match, thus ending the show with the two brawling. The next week on the October 5 NXT, Kaitlyn lost the "Bull Riding" competition, won the talent contest by drawing an insulting picture of Vickie, and went on to main event the show winning her first singles match against Vickie. On the October 12 NXT, Kaitlyn lost the "WWE Name that Tune" challenge and the "Power of the Punch" challenge. The next week of NXT, Kaitlyn lost a match against Maxine, the "WWE Who's that Body" challenge, and the limbo contest. On the October 26 Halloween-themed NXT, Kaitlyn won a costume contest impersonating Vickie, and lost a candy eating competition due to her choking and then accidentally throwing up on Vickie. On the November 2 NXT, Kaitlyn and Ziggler were found kissing behind a wall, and when Vickie confronted them, Kaitlyn threw a cake, which was meant for Goldust and Aksana's wedding, into her face. On the November 5 SmackDown, Kaitlyn and Vickie faced each other in a rematch in which Vickie was victorious after her foot was on the ropes. On the November 9 NXT, Kaitlyn won an arm wrestling competition, and brawled again with Vickie backstage. The next week on the November 16 NXT, Kaitlyn was defeated by Naomi in singles competition, and was safe from elimination. On the November 30 NXT season finale, Kaitlyn defeated Naomi in a rematch, and was later announced as the winner of season three, defeating Naomi in the final to become WWE's Breakout Diva. On the December 3, 2010 episode of SmackDown, Kaitlyn appeared in a backstage segment with Vickie Guerrero and Dolph Ziggler, announcing that SmackDown General Manager Theodore Long had signed her to the brand following her victory on NXT. She had her first match on SmackDown on January 28, 2011, where she and Kelly Kelly were defeated by LayCool (Layla and Michelle McCool). On the May 27 episode of SmackDown, Kaitlyn formed a tag team with AJ known as the Chickbusters, which led to their first match as a team being accompanied by their mentor Natalya against the team of Alicia Fox and Tamina in a losing effort. The Chickbusters were again defeated in a rematch against Fox and Tamina the following week. On the June 13 episode of Raw, Kaitlyn picked up her first win in a fourteen-Diva tag team match alongside fellow Chickbuster AJ, Natalya, Beth Phoenix, Eve Torres, Kelly Kelly, and Gail Kim against Alicia Fox, Tamina, Rosa Mendes, Melina, Maryse, and The Bella Twins, with Kelly pinning Rosa. The Chickbusters and Natalya continued to feud with Fox and Tamina, who were soon joined by Rosa Mendes in a six-Diva tag team match on the June 23 episode of Superstars, with AJ pinning Fox. On the August 5 episode of SmackDown, Chickbuster partner AJ lost a singles match to Natalya, who then turned on her protégé, attacking her and declaring war on the "perky little princesses" that comprised the rest of the Divas division. The Chickbusters lost to the Divas of Doom (Natalya and Beth Phoenix) in a tag team match the following week, and were attacked by both members after the match. Throughout the next few months, the Chickbusters continued to feud with the Divas of Doom, losing both singles and tag team matches to them. In November, tension began to be teased between the Chickbusters, with Kaitlyn upset at their repeated losses to the Divas of Doom. On the February 1, 2012 episode of NXT Redemption, Kaitlyn began feuding with Maxine, who accused Kaitlyn of having a secret crush on her boyfriend Derrick Bateman. On the February 8 episode of NXT Redemption, Kaitlyn lost in singles competition to Maxine. After weeks of feuding with Maxine over whether the latter was good for Bateman, on the February 29 episode of NXT Redemption, Kaitlyn would confess her feelings for Bateman in an "intervention" segment also including Alicia Fox and Justin Gabriel where she would end up kissing Bateman before being interrupting and attacked by Maxine, and would later that night defeat Maxine in the main event. On the March 14 episode of NXT Redemption, after Kaitlyn and Bateman defeated Johnny Curtis and Maxine in a mixed tag team match, Bateman would afterwards kiss Kaitlyn, thus solidifying their relationship. On the March 21 episode of NXT Redemption, Kaitlyn and Bateman were backstage with Tamina talking about her and Bateman's new found relationship, and later would encounter Maxine and Curtis, who accused both Kaitlyn and Bateman of being involved with Matt Striker's random disappearance. On the April 4 episode of NXT Redemption, Kaitlyn was defeated in singles competition by her former mentor Natalya, who was accompanied by Tyson Kidd on commentary. Kaitlyn and Bateman discovered Striker in a janitor's closet hidden by Curt Hawkins and Tyler Reks on the April 11 episode of NXT Redemption. On the April 25 episode of NXT Redemption, Kaitlyn was backstage with Kidd and Percy Watson asking about Kidd's new submission maneuver, until Natalya approached them and accused Kaitlyn of flirting with Kidd, which led to a tag team match teaming with Tamina Snuka in a winning effort against Natalya and Maxine with Snuka pinning Maxine. In April 2012, Kaitlyn returned to SmackDown in attempt to comfort fellow Chickbuster AJ backstage, but was assaulted on two separate occasions. This led to a match between the two on the May 11 episode of SmackDown, in which Kaitlyn was defeated by AJ. Two days later on Twitter, Kaitlyn announced that she was officially breaking up the Chickbusters. Kaitlyn went on to compete in her first pay-per-view match at Money in the Bank, where she teamed with Divas Champion Layla and Tamina Snuka against Beth Phoenix, Natalya, and Eve Torres, with her team coming out victorious. In August 2012, Kaitlyn asked and was given a job from SmackDown General Manager Booker T as his assistant, but was afterwards put in a match against an angry Eve in which the winner would be awarded the job. The following week on SmackDown, Eve won the assistant job when she defeated Kaitlyn. Three days later on Raw, Kaitlyn won a Diva battle royal to become number one contender to Layla's Divas Championship. On the September 3 Raw, Kaitlyn was defeated by Eve with Layla on commentary. The next week on the September 10 episode of Raw, Kaitlyn teamed with Layla and Eve in a six-Diva tag team match where they defeated Beth Phoenix, Natalya, and Alicia Fox, and afterwards Eve hugged both Layla and Kaitlyn and raised their arms in victory, leaving them confused. At the Night of Champions pay-per-view, Kaitlyn was attacked by a masked figure injuring Kaitlyn's ankle, therefore being forced to forfeit her title shot with Layla to Eve. Kaitlyn later stated that the wrestler that attacked her at the Night of Champions pay-per-view was blonde, leading to Beth Phoenix becoming the suspected attacker. On the October 8 episode of Raw, Kaitlyn faced Eve in her first Divas Championship match and lost, and was afterwards saved by Layla from Eve who attempted to re-injure her. Two weeks later on the October 22 episode of Raw, Kaitlyn confronted Eve about her attacker, revealing it to be Aksana, who was e-mailed by Eve to attack Kaitlyn at Night of Champions, and ended in a brawl also involving Layla. This would lead to a tag team match on the October 26 episode of SmackDown with Kaitlyn teaming with Layla in a loss to Eve and Aksana after Layla accidentally kicked Kaitlyn. Kaitlyn received another shot for the Divas Championship at the Hell in a Cell pay-per-view, but was again defeated by Eve in a triple threat match, also involving Layla. On the November 6 episode of Raw, Kaitlyn teamed with Layla in a tag team match against Eve and Aksana in a winning effort after Kaitlyn pinned Eve. The following week on the November 12 episode of Raw, Kaitlyn defeated Layla in singles competition to become the number one contender for the Divas Championship against Eve at the Survivor Series pay-per-view. The same week on the November 16 episode of SmackDown, Kaitlyn competed in a six-Diva tag team match along with Layla and ex-rival Natalya in a winning effort against Eve, Aksana, and Alicia Fox with Kaitlyn pinning Fox. At Survivor Series, Kaitlyn was again attacked from behind by Aksana, and went on to face Eve for the Divas Championship, but was unsuccessful in retrieving the title. Kaitlyn would get her revenge on Aksana the following night on the November 19 episode of Raw and the December 14 episode of SmackDown, defeating her in singles competition. At the TLC pay-per-view, Kaitlyn competed in a number one contender Santa's Little Helpers Diva battle royal to face Eve for the championship, but was unsuccessful in winning the match due to interference from Eve. On the December 17 Raw, Kaitlyn defeated Eve in a non-title match. The next night on the December 18 SmackDown, Kaitlyn defeated Eve via disqualification in a title match after Eve tripped the referee to keep the title. On the January 7, 2013 Raw, Kaitlyn would receive another title match against Eve, winning the match via count-out after Eve fled the arena. On the January 14, 2013 special 20th Anniversary episode of Raw, Kaitlyn faced Eve Torres in her hometown of Houston, Texas for the WWE Divas Championship with the stipulation that the title would change hands if Eve got disqualified or counted-out. Kaitlyn defeated Eve to become the Divas Champion, thus making Kaitlyn the first NXT Diva in history to win the championship. Kaitlyn's first title challenger was Tamina Snuka, whom Kaitlyn faced at Elimination Chamber; Kaitlyn won to retain her title. In February, Kaitlyn teased starting a relationship with Cody Rhodes, but she ultimately decided against having a relationship with Rhodes when she saw him with the Bella Twins. On the March 25 episode Raw, Kaitlyn would begin a feud with her former Chickbuster partner AJ Lee after they brawled backstage, and faced each other in singles competition with Kaitlyn losing the match via countout. On the March 27 NXT, Kaitlyn successfully defended her WWE Divas Championship against Natalya. That same week on the March 29 episode of SmackDown, Kaitlyn would get her revenge on AJ in a mixed tag team match alongside Daniel Bryan, accompanied by Kane, in a winning effort against AJ and Dolph Ziggler, accompanied by Big E Langston, after Kaitlyn pinned AJ. AJ then managed to become the number one contender for Kaitlyn's title, and on the April 24 episode of NXT, Kaitlyn successfully defended her Divas title against AJ. 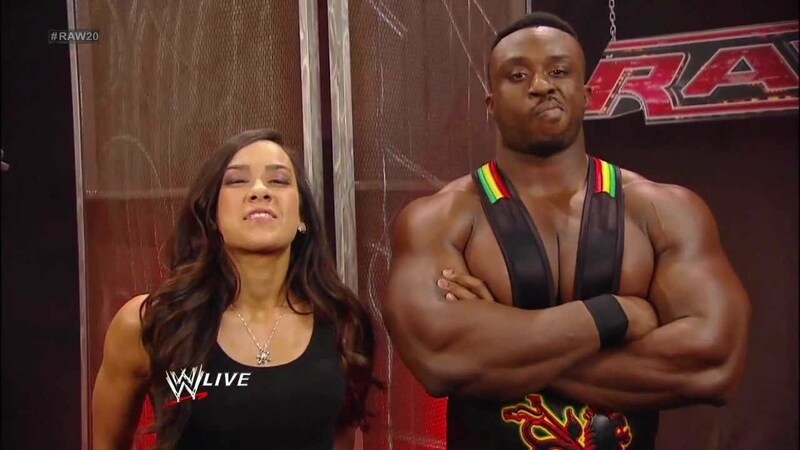 Kaitlyn then entered a storyline where she received gifts from a secret admirer, who was revealed on the June 10 episode of Raw, and it turned out to be Big E. Langston. However, this was a cruel mind game by AJ for "abandoning" her, which would lead to Kaitlyn viciously attacking AJ before their championship match at the Payback pay-per-view, where Kaitlyn was defeated by her former best friend, ending her reign at 153 days. The feud between the two continued with them attempting to distract each other to gain leverage. On the July 12 episode of SmackDown, Kaitlyn was a part of the first-ever in WWE history public Divas Championship match contract signing for the Money in the Bank pay-per-view along with AJ, which would end in a brawl between the two. At the Money in the Bank pay-per-view, Kaitlyn was again unsuccessful in regaining the Divas Championship due to an elbow injury. Kaitlyn would make her return on the July 26 episode of SmackDown interrupting AJ's rage on Ziggler, and delivering a spear to AJ, leading to a match between the two on the July 29 episode of Raw, with Kaitlyn emerging victorious. With this win, Kailyn received a Divas Championship match against AJ in her hometown of Houston, Texas on the August 2 episode of SmackDown which Kaitlyn lost after Layla turned into a villain by betraying Kaitlyn and protecting AJ. On the August 5 episode of Raw, Kaitlyn would compete against her former friend Layla in singles competition, but would be distracted by AJ, causing Kaitlyn to lose the match, and would later that night attack AJ during Ziggler and Langston's match, costing Ziggler his match as well. At the SummerSlam pay-per-view, Kaitlyn and Ziggler emerged victorious in their mixed tag team match against AJ and Langston, thus ending their feud. At Survivor Series, Kaitlyn participated in a seven-on-seven traditional Survivor Series elimination tag team match as her team, which also included her rival AJ, took on the cast of Total Divas. Kaitlyn managed two eliminations before she was eliminated, with her team ultimately losing the match. On January 8, 2014, Kaitlyn decided to terminate her contract with WWE. Her final match aired that same night on Main Event, where she lost to AJ. In her final address to the WWE Universe, she stated that she will return to the fitness industry and would also be starting her own fitness clothing company, named Celestial Bodiez. On the December 3 episode of SmackDown, Kaitlyn appeared in a backstage segment with Guerrero and Ziggler, announcing that SmackDown General Manager Theodore Long had signed her to the brand following her victory on NXT. She had her first match on SmackDown on the January 28, 2011, episode, when she and Kelly Kelly were defeated by Team Lay-Cool. Kaitlyn later lost in singles competition against Layla on March 11. On the May 27 episode of SmackDown Kaitlyn formed a tag team known as The Chickbusters with AJ. In their first match as a team lost to the team of Alicia Fox and Tamina. The duo were accompanied by Natalya, who became a mentor of sorts to the pair. AJ and Kaitlyn lost a rematch to Fox and Tamina the following week. Her first victory came on the June 10 episode of SmackDown, when she pinned Tamina in a singles match, a feat she repeated on the July 8 episode. AJ, Kaitlyn, and Natalya continued to feud with Fox and Tamina, who were joined by Rosa Mendes. On the August 5 episode of SmackDown AJ lost a singles match to Natalya, who then turned on her protégé, attacking her and declaring war on the "perky little princesses" that comprised the rest of the Divas division. The following week, Kaitlyn and AJ lost to Natalya and Beth Phoenix in a tag team match. Throughout the next few months, The Chickbusters continued to feud with the so-called Divas of Doom, losing both singles and tag team matches to them. In November, tension began to be teased between The Chickbusters, with Kaitlyn upset at their repeated losses to The Divas of Doom. Kaitlyn married fellow bodybuilder PJ Braun on June 20, 2014. ↑ 1.01.11.21.31.41.51.6Kaitlyn. Online World of Wrestling. Retrieved on 2010-09-15. ↑ 2.02.12.22.3Kaitlyn Bio. World Wrestling Entertainment. Retrieved on 2010-12-04. ↑ Texas Births, 1926-1995. Family Tree Legends. Retrieved on January 7, 2012. ↑ Kaitlyn. Florida Championship Wrestling. Retrieved on December 14, 2011. ↑ 2008 Arnold Classic and Arnold Amateur; NPC Figure Class D. HardFitness Magazine Online. Retrieved on December 14, 2011. ↑ 2007 Musclemania Superbody – Masters; Official Final Results; 2007 FIGURE UNIVERSE – TALL. Musclemania. Retrieved on December 14, 2011. ↑ 2009 NPC Jr. Nationals; NPC Figure. HardFitness Magazine Online. Retrieved on December 14, 2011. ↑ Mulero, Ed (January 15, 2011). 10 Hot Sports Women. Made Man. Retrieved on December 14, 2011. ↑ Hillhouse, Dave (2010-12-04). Smackdown: Three men and a dummy. Slam! Sports. Canadian Online Explorer. Retrieved on 2010-12-06. ↑ Hillhouse, Dave (2011-01-29). Smackdown: Babyfaces behaving badly. Slam! Sports. Canadian Online Explorer. Retrieved on 2011-01-30. ↑ Hillhouse, Dave (March 12, 2011). Smackdown: Less rock, more talk. Slam! Sports. Canadian Online Explorer. Retrieved on December 12, 2011. ↑ 13.013.1 Hillhouse, Dave (May 28, 2011). Smackdown: The People’s Court calls the shots again. Slam! Sports. Canadian Online Explorer. Retrieved on December 12, 2011. ↑ Hillhouse, Dave (June 4, 2011). Smackdown: Christian's patience wearing thin. Slam! Sports. Canadian Online Explorer. Retrieved on December 12, 2011. ↑ Hillhouse, Dave (June 11, 2011). Smackdown: Factions renewed and rejected. Slam! Sports. Canadian Online Explorer. Retrieved on December 12, 2011. ↑ Tylwalk, Nick (July 8, 2011). SmackDown: Orton, Christian and Sheamus continue their three-man weave. Slam! Sports. Canadian Online Explorer. Retrieved on December 12, 2011. ↑ Hillhouse, Dave (June 18, 2011). Smackdown: Fair is foul, and foul is fair. Slam! Sports. Canadian Online Explorer. Retrieved on December 12, 2011. ↑ Hillhouse, Dave (July 30, 2011). Smackdown: New Game in town. Slam! Sports. Canadian Online Explorer. Retrieved on December 12, 2011. ↑ Hillhouse, Dave (August 6, 2011). Smackdown: Firing on all cylinders. Slam! Sports. Canadian Online Explorer. Retrieved on December 12, 2011. ↑ Waldman, Jon (August 12, 2011). Smackdown: Eventful last show before Summerslam. Slam! Sports. Canadian Online Explorer. Retrieved on December 12, 2011. ↑ Hillhouse, Dave (September 17, 2011). Smackdown: Rated "R" for "Retirement". Slam! Sports. Canadian Online Explorer. Retrieved on December 12, 2011. ↑ Hillhouse, Dave (September 24, 2011). Smackdown: Blood on TV and a title match. Slam! Sports. Canadian Online Explorer. Retrieved on December 12, 2011. ↑ Hillhouse, Dave (November 26, 2011). Smackdown: Give and take. Slam! Sports. Canadian Online Explorer. Retrieved on December 12, 2011. ↑ Gibbons, Elliot (January 19, 2011). FCW TV results 1/16: Report on WWE's developmental territory – Mason Ryan defends FCW Title, NXT Rookies battle. Pro Wrestling Torch. Retrieved on January 19, 2011. ↑ Meltzer, Dave (January 26, 2011). "Biggest issue of the year: The 2011 Wrestling Observer Newsletter Awards Issue": 1–40. ISSN 10839593. The text in this article is based on the Wikipedia article "Kaitlyn (wrestler)" used under the terms of the GNU Free Documentation License or the Creative Commons CC-BY-SA license. See Boobpedia's copyright notice.